Last summer one of my friends had to drive alone to a gig 50 miles from our hometown. The rest of us followed in another car. When he drove off, he said: “I’m going think about a great idea by the time we arrive.” An hour later, he said something miraculously had happened and he had found his idea. A few months later, a rather surprising team was gathered to build his idea. One developer, one print designer, one tv producer and myself, next to the instigator of the idea. As none of the team members were familiar with agile or lean practices, I was thrilled to use this project as a sandbox to apply the lean startup philosophy. The basic idea was simple: everyone has doubts. Small doubts (what should I eat tonight?) and big doubts (which car should I buy?). People like to address their friends and family to ask advice on these choices, but they don’t have any tools at hand. That’s where Doubtcloud comes into the picture. The plan was to build a tool that allows people to easily share twofold doubts with their friends via the network of their choice. On the first meeting in September, we talked about the name, the logo and the general purpose. We laid down a first version of our Business Model Canvas, and finished with a backlog. As a user I can view doubts so I know what people are doubting. As a user I can pick a doubt so I can advise my friend. As a user I can create a doubt so I can ask advice to my friends. We deliberately kicked out everything that had to to with registration or sign-up. The first version was all about testing value and growth hypotheses we had, in line with the core of our idea. As we didn’t want to waste too much time before validating our hypotheses, we decided to make our first version a “beta for friends”. We placed the application behind a password as from January, and interviewed each 5-10 friends (or parents), with different digital skillsets. Face to face. We added a feature so people could choose to receive a summary of results after an hour/day/week/month. We moved some elements, e.g. the description field. We created the “Maniac Mode”, that gives a user a new doubt immediately after they picked a first doubt. Everything was tested, and we built a mobile friendly version for iOS, before launching v1.0 on February 15th. 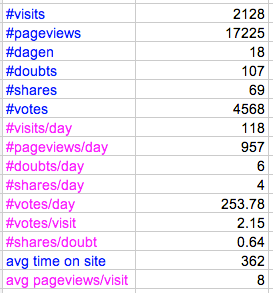 The metrics time on site, votes/visit were key in our value hypothesis. We also saw immediately that the number of shares/doubt was not as high as expected, which answered a part of our growth hypothesis. Don’t hesitate to use Agile/Lean/Gamestorming with a team that has never heard of it. Especially non technical people aren’t as resilient as you would think. Start prioritizing from meeting one and focussing on a Minimum Viable Product. You don’t need to go public to test things. When interviewing 20 people you will get 80% of the feedback you would have from a thousand people. Stay tuned. I’ll post what happened in version 1.1 and 1.2 the following weeks. Hi Frits, I am not surprised Doubtcloud reminds you of the Polar app. Although the general idea is quite similar, the approach isn’t. For example, we decided to start building the web version first because we wanted to create a perfect basis for future developments. We’ve already seen it gives us more flexibility building specific features. For now we continue working on the web version. Once the web version is satisfying the Doubtcloud app will follow too! I think it is very interesting Polar exists. I’m sure we could learn form each other’s experiences! Quite addictive! The idea reminds me a lot of Polar app by LukeW. They have a few writeups about their onboarding process and general approach which might be of interest if you havent seen them yet. Thanks for your comment. We talked about Maurya’s Lean Canvas a lot during the first meetings. We didn’t use the process as described by him, but we did some elevator pitching on the general idea. We also would have used some insights from Lean UX, but that book wasn’t available at the time :).